Samra Kala, a university student based in the UK has been fascinated with mehandi designs since the age of 9. She even loves to decorate candles with mehndi! Here is a Maths student who has been applying mehandi on others at a very young age. At 18, she was providing henna training classes. This young lady is passionate about mehandi. 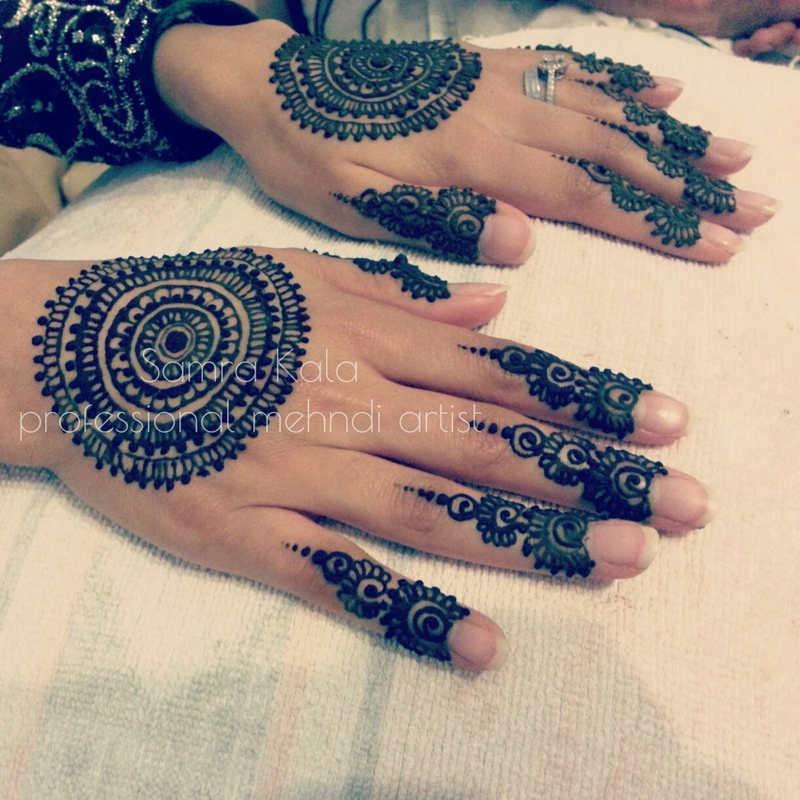 Read on to know Samra’s memorable experiences and favorite mehandi designs. (In case if you’d like to see the other interviews with mehandi artists, click here, here, here, here, here, here, here, here, here and here). My name is Samra Siraj Kala, I am 21 years old and based in the UK. I’m currently at university studying for a BSc Honours degree in Mathematics. I have been interested in mehandi for as long as I can remember and began by drawing mehandi designs on paper or whatever surface I could find! I first started applying henna on others when I was around 9 years old. I thought of getting into this line and providing my services for others after a lot of encouragement from my parents and my brother. As a little girl I’d settle for having ANYTHING applied on my hands, whether it was having my entire palms dipped in henna, or just having the dipped fingertips for Eid and weddings. I only got better at this skill after years and years of practice. I began getting recognition through recommendations by family and friends, and by taking part in helping raising funds through holding henna stalls at charity events. This enabled me to build my confidence and allowed me to gain a lot of experience. When I was 18 I started providing henna training classes, but due to my studies, this is something that’s currently on hold until after I graduate. My henna isn’t restricted to just bridal applications, I also decorate household items and candles with mehandi designs. My all-time favorite design has got to be the Mandala/Chakra/Teeka design! It’s traditional yet very classy, neat and simple. This design is perfect to match a traditional bridal outfit. One of my own favorite designs that I keep applying regularly and is hugely popular with brides who opt for a minimal or a contemporary yet elegant look, has got to be my three-strip design. Personally, this is one of my favorites and I don’t think it will ever go out of fashion as it very unique. 3. Most memorable experience you had while doing mehandi designs (something that has stayed close to your heart and is remembered very fondly? 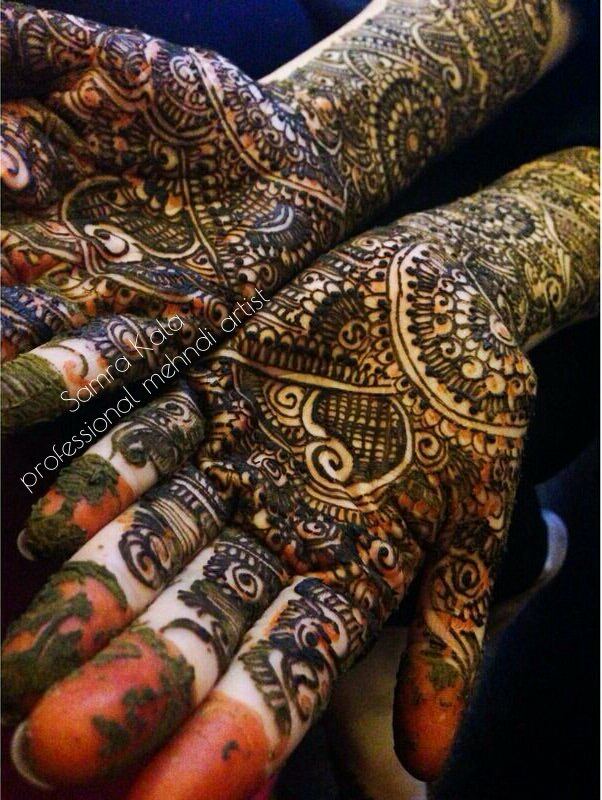 I have had many memorable experiences while applying mehandi – too many to note down! However, doing henna for a bride means that I am part of those very last moments she shares with her family, so being part of that for a short amount of time is very special in itself. I am the one who plays a massive part in making her feel like a bride and so to hear them say, ‘Oh my God, I feel like a bride now’ is a very satisfying feeling. Another good feeling is when brides say they don’t usually like henna but were willing to have it applied after they’d seen my work. The best feeling is when they leave everything entirely up to me (which can actually be nerve wracking!) but love the outcome – that is what makes my job so worthwhile. My clients are more than just clients to me, I have built some amazing relationships over the past 11 years and am very good friends with some of my brides and their families. 4. What are your most important tips to take care of mehandi designs after applied? I. To use natural henna (please stay away from black henna or the “emergency” cone which usually has a red watery consistency, as this is unnatural and unsafe to use). II. Ensure that the natural henna has some sort of essential oil added to the mixture, i.e. eucalyptus oil (my favorite), tea tree oil or lavender oil. III. Leave the henna paste on for a good few hours, seal it with lemon and sugar solution – to prevent the henna paste from flaking off. IV. Remove henna by flaking off and avoid contact with water after removal for at least 12 hours. The ultimate secret behind a good stain is heat. Keep warm and give the areas which have henna applied as much heat as you can, as naturally henna is quite cooling on the skin. In general, the henna stain does take approximately 48 hours to reach its deepest color, so be patient and don’t be disheartened at the bright orange stain you see upon removal of the henna! The best way to reach me is to contact me on Facebook and to follow me on Instagram. Alternatively, you may contact me via email: samra_kala@hotmail.co.uk. (Published with permission of Samra Kala. Please don’t use these images without permission from the original source.) Click on the image to view them larger.